This article offers an exploration of the relationship between photography and identity in the marginalised urban space, focussing specifically on the annual Hope in Shadows photography contest in Downtown Eastside Vancouver (DTES). Through an analysis of field-based research, I demonstrate how individuals in the DTES have used photography to (re)create notions of self and community identity, and explore what findings suggest for the development of participatory, visual methodologies. I discuss how a participatory visual model might enable socially excluded individuals to engage with the public sphere, actively claiming recognition within and outside of the DTES neighbourhood. Drawing on existing literature in visual sociology, this article explores the potential of resident-led photography in emancipating participant ‘lifeworlds’ from their excluded status, opening up multiple avenues to social action. I argue for the potential of the camera in person-centred research: promoting a recognition of C. Wright Mills’ (1959) ‘personal troubles’ as ‘public issues’, encouraging dialogical understandings between urban in-groups and out-groups, and enabling the (re)assertion of affirmative social presence for excluded urban communities. In this short essay we present a Danish research project called ‘Images of the Global Periphery’. Through the use of visual methodologies, the project focuses on belonging and home-making among newcomers, thereby addressing how geographic mobility is implicated in ‘everyday belonging’ and people’s experiences of being ‘at home’. The essay argues that a visual approach provides valuable empirical additions to our understanding – and it contributes to a further theorizing – of place affiliation, mobility and belonging in a globalized world. Furthermore, while most previous research on globalization, belonging, and mobility have failed to incorporate gender perspectives, our preliminary empirical findings indicate that gender, marital status, parenthood, job situation and country of origin all matter in developing a sense of belonging. Such positionalities play a role in the attempt to understand the uneven and often contradictory ways in which global processes and local identities come together. This paper discusses the development and outcomes of a research methodology employing photographic postcards as remote, performative-narrative research tools to elicit and record written responses to the regenerated central canal landscape in Birmingham, UK. The canal landscape was chosen as the research formed part of an AHRC Collaborative Doctoral Award between Birmingham Institute of Art and Design and British Waterways (renamed The Canal and River Trust since July 2012), entitled ‘Landscape Narratives and the Construction of Meaning in the Contemporary Urban Canal-scape’ (2012). A postcard featuring an instruction and six images of the canal landscape arranged in a grid format was produced, distributed and returned during 2010. The 160 responses from an ethnically, age and gender-diverse group highlight the multiplicity of meanings and landscape preferences converging on the contemporary canal-scape. The returned narratives include instances of emplaced memories and associations. Data suggest this is an effective means to elicit and record individuals’ landscape perceptions where the potential for researcher-participant interaction may be limited, for instance by a lack of time or accessibility. This introductory study explores the meanings and images of ‘home’ for a student living in student accommodation within the United Kingdom. 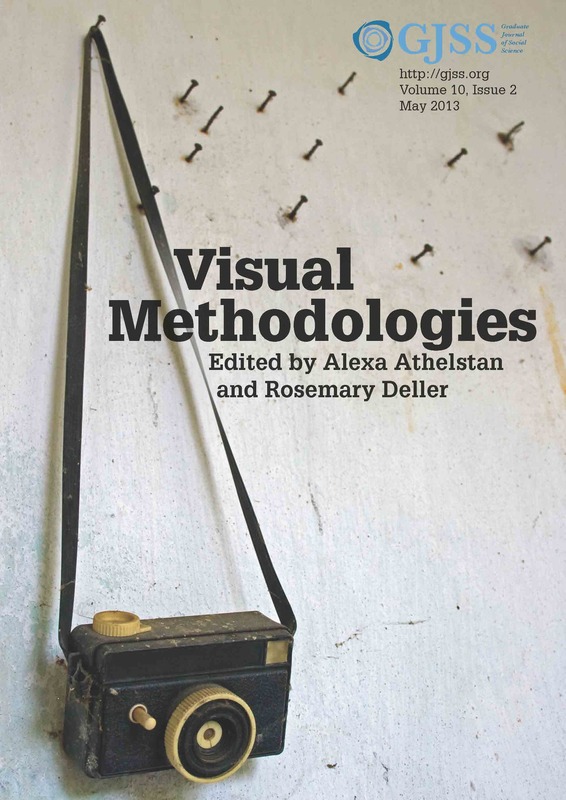 It makes a case for the use of visual methodologies, as well as outlining their contribution to theorising the geographies of space, gender, and the home. In addition to furthering debates about the meanings of ‘home’, it establishes the visual as a valid form of sociological knowledge, ethnography, and representation, and adds to critiques of visual methodologies more broadly. Employing a combination of auto-photography and photo-elicitation methods, this study forms a collaborative effort between research participant and researcher, to create and interpret the visual images of 'home'. The setting of the ‘home’ – regarded as one of the most familiar places for its occupants – is defamiliarised and made strange and interesting again through the medium of photography. This study positions itself within this research gap and dilemma by building on existing work which has sought to 'make the familiar strange' through creative methodologies. The aim of this paper is to provide a case for using participant-generated photos and diagrams in qualitative interviews. These visual methods are gaining momentum in sociology and the research presented in this paper builds on previous uses of photo elicitation with members of shared households (Heath and Cleaver 2004), couple households (Morrison 2010) and uses of graphic elicitation with family households (Gabb 2010). I draw on data from the early stages of my doctoral research on young adults' living arrangements. This research is investigating households which are comprised of a romantic couple and other unrelated adults, focusing on those in early adulthood in the UK. This paper addresses my use of photos and three diagrammatic activities: relationship maps, timelines and 'household maps'. Through presenting preliminary data, I demonstrate the suitability of photo and graphic elicitation for researching three connected aspects of the social world – relationality, temporality, and spatiality – and discuss the practical and ethical considerations associated with implementing these methods. Research with young people and children has developed over a number of years an argument for researching with, rather than on, younger participants (Thomson, 2008; Valentine, 1999). In qualitative research, the ways in which we carry out empirical research, the relationships that are developed between researchers and participants, the knowledge that is produced and the epistemological and theoretical foundations can be affected by how as powerful researchers we aim to observe and analyse. Where age, gender and ethnicity intersect in creating something of a "difference" between researcher and participants, these issues can need greater consideration. This paper presents some methodological background to the choices made concerning data production during a project in which a white, female, late-20s researcher with a feminist theoretical background investigated physical activity engagement by a diverse cohort of 13–14 year old students in an inner city secondary school in the Midlands, UK. By combining visual ethnography, interviews and collaborative photography, the project aimed to address concerns about student voice in research with young people on their school and sport experiences (O’Sullivan & MacPhaill, 2010). The paper considers some possibilities and challenges of using this methodology within school-based studies. Reflections from this project are offered on the ways in which participants retained power over content and meaning of their photographic contributions, and researcher relationships in the field. Visual methods are argued to offer an additional tool in tackling traditional power relations and encouraging participant investment. This paper presents a review of the use of auto-driven photo-elicitation interviews in research with young d/Deaf people as a tool for equalising power imbalances caused by linguistic difference. A brief review of the ways in which other qualitative research methods have been adapted to attempt to make them more accessible to d/Deaf participants is offered. The method of auto-driven photo-elicitation interviews is then outlined with specific focus on its relevance to research with d/Deaf people, before presenting a background to the research project for which this method was used. This project examined the experiences of transition to adulthood and transition planning of eight young d/Deaf people from the South West of England. Finally, the advantages and disadvantages of auto-driven photo-elicitation interviews are discussed. This article consists of two parts. The first part is a discussion of the annual international Urban Photography Summer School, organized by Goldsmiths, University of London. This testimony is based on the author’s participation in the latest edition of this two-week event. The discussion is interesting to bring this course under attention and can be relevant for future candidates. Two main points of general interest are focused on: (1) the relationship between aesthetics and research value in photography, and (2) the relationship between text and image. The second part of the article is a photo essay with the author’s own final visual project that was produced and presented during the summer school. The images explicitly link back to the more epistemological questions in the first part. The essay deploys street photography to observe performativity and human behavior as it is structured by or opposed to the rhythms that create a city. Therefore, it refers to sociologist Henri Lefebvre’s approach of rhythm analysis.